When first arriving in Colombia, all twenty-nine English teaching assistants were put up in a fancy hotel for a week-long orientation. Between listening to speeches from representatives of the U.S. Embassy, members of the Colombian Ministry of Education, and chatting with past Fulbrighters who had remained in the country, we enjoyed free food from the hotel and hot showers. But, alas, it was not meant to last and when our orientation came to an end we were all sent on our merry way to whatever city housed our university. Unlike some of the universities that other Fulbrighters were placed at in Bogota, my university did not supply me with temporary housing when I first moved to the city. I found my housing through an online short-term rental website and, while it was certainly a wonderful, clean place for being cheap, I did not enjoy the fact that the neighbors blasted classical music from their attic from 9AM to 6PM every day. 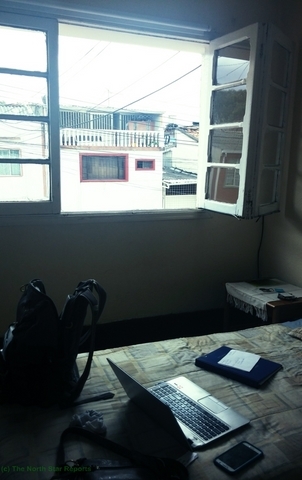 I and two other women working at other locations in Bogota had decided to try and find rooms to rent in the same apartment. While waiting for our universities to begin their semesters, we spent our first real week in Bogota wandering the city to tour apartments and houses renting rooms to students. The neighborhood in which we were searching, Chapinero, is home to many of the universities of Bogota. It’s a mixture of housing for students, families, professionals, and also contains many different commercials districts, malls, and offices. Some areas can be incredibly safe and affluent and some areas can be incredibly unsafe. My university, for example, is mostly converted mansions that were owned by the elites of Bogota a few decades ago before they decided to move north during a series of riots. The area appears incredibly glamorous and is safe to walk around in during the day, but I’ve been told several times to avoid the area at night. The first few places we visited did not meet our expectations– expectations that have been influenced and shaped by housing standards in the United States. The kitchens were small and narrow, the bedrooms were dark, or the bathrooms were small and seemed unclean. At some of the places we toured, we learned that students weren’t allowed to use the kitchens; we had to pay for meals that would be cooked for us by the landlady. We also ran into the issue that we are not allowed to directly rent apartments in Colombia. In order to rent, potential renters must have finca raiz. In order to directly rent in Colombia you need to either be or have a co-signer who is a land-owning citizen. Therefore, the majority of us have options that are limited to subletting rooms of some sort. In the end, we found a lovely building at the corner of a park that rents rooms in three different floors of an apartment building, targeting mainly foreign students studying or completing internships abroad. 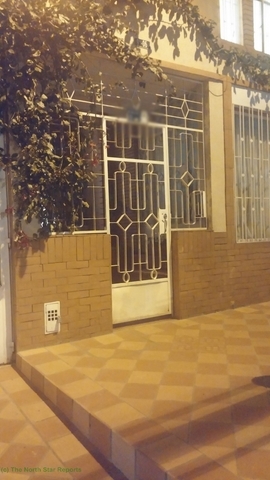 The cost of rent is a bit high (about $780,000 pesos or about $250 in the United States) for Bogota, but it comes with a ridiculous amount of amenities that are not the norm in the United States, such as laundry and daily cleaning services. After only week and a few days living in another country, we managed the surprisingly difficult feat of finding a place to live! Now I have a place to call home for the next ten months. I think it’s really important to consider how our home life shapes our expectations, things we consider essential to everyday life, things we take for granted, etc. Sometimes I forget that we’re all global citizen with some incredible differences to other people around the world. We’re all different people with different struggles, some we can relate to, others we have no idea of. I think the only way to truly appreciate how others live is to visit and live like them. Laura, it is so wonderful that you have had the opportunity to travel abroad to a so many places. It is also wonderful that you were able to follow your dreams and become a teacher. I would love to hear about your teaching experiences in Columbia as well! I hope you will share more articles about it on here in the future. It was interesting to read about the different areas of the city that you described. When you were describing the more “college-town” like areas it surprised me to hear that some areas were significantly safer than others. I suppose I am curious as to how large the University area is and how far in proximity these areas are to each other! How does Colombia compare to Mexico so far? Does the language seem pretty much the same, or is it almost an entirely different kind of Spanish? I have a friend spending his senior year of high school doing Rotary Youth Exchange in Colombia, it would be interesting to compare his experiences so far to yours. Do you think you’ll be able to tolerate (and enjoy) living there for an entire year? From my experiences, the Spanish between Mexico and Colombia is quite different. It might be due to the fact that I´ve been in Bogota longer so I´ve gotten the chance to learn more slang, but I feel like the idea of “regional dialects” is much more prevalent here. Everybody I meet will readily talk about how pronunication and slang will change throughout Colombia depending on if you`re in the Andes or on the coast. Other Fulbrighters in the program that work on the coast have often talked about how different (and often difficult) it is to understand Spanish from the coast! Congratulations on following through with what you would like to do in life, it’s inspiring! It sounds like such a change of pace compared to Duluth, MN. Housing is not forwardly something I consider when thinking of all the differences when moving to another country. I also would have expected it to be insanely buggy in Bogota, so that’s very surprising. While teaching, I would love to hear a comparison of the experiences you have had here in Duluth and there in Bogota in relation to the students, the expectations of teachers in the community, and the way of life. Good luck! Why does a person need a land owner as a co-signer? That seems like a strange requirement for renting. Is that common just around the university or all over the country? I would be interested to know if the university atmosphere is similar or different to that in the US. Also I would not have guess that there wouldn’t be a problem with bugs in Bogota, what a pleasant surprise that must have been! Colombia would be an amazing place to live and study! I´m not 100% sure why a co-signer is required, but it is something that is practiced across the country (not just in university areas). Most people get around signing a lease contract by sub-letting. The university atmosphere is very different from in the US! There are some top-tier universities in Bogota that mimic the educational atmosphere of colleges in the United States, but the universities that most of are placed at are very different. A few examples include: no humanities courses, very few extra-curriculars, and no main campus (locations are sometimes in rented office buildings). Many students also work full time, so courses usually take place in the evenings and Saturdays. I appreciate the details of the houses and apartments, they are so different from our options of “nice” housing in America. When I was Germany and Japan, kitchens were small with little counter space and cupboards, and it seems that may be more normal than I expected. The focus of the house was the living room not the kitchen as it is in America, and thats refreshing. It’s odd that one would have to be a land owner to rent, does that make it hard for the average citizen to rent or is land ownership a common thing? Thank you for sharing your adventure! It´s definitely surprising how different the “standards” for housing are between countries. It isn`t something I thought about at all before looking for an apartment. The rules about finca-raiz are a bit different that in the states. I don`t think that it makes renting particularly difficult judging by how easily all of us found places to sub-let (and I would assume that Colombians looking to rent would be better at searching than those of us that just entered the country!). I’m also going into education and I think the experiences of travelling are so beneficial in classrooms for so many reasons. It’s so important to understand where some of your students may be coming from or just to know that there’s more to the world than where you’re from. I think it is so cool you’ve had all these experiences as they can only help you. I hope your time in Bogota is full of amazing experiences that help you become an awesome teacher. It is amazing that you get the chance to see and live in another country. It is interesting to learn that living accommodations in Colombia are greatly different for that of the price, compared to America. I think you will be teaching a lot to students there. It sounds like you will be really helping out around your university. The experiences of traveling are so amazing! I have a strong travel bug, and love learning about all the places I go to. I would have never thought that there would be so many bugs in Bogota. I thought the South America continent was pretty much devoid of them. Overall great article :). It seems like you had your struggles in the beginning and where able to persevere and make the best out of your experience. I’m interested in knowing more about the feelings that students had while learning English? Did you find it difficult to teach a language to students that you have spoken throughout your life? Overall, the experiences that you obtained with your journey to Colombia seem like they will benefit you greatly in the future. I am still currently teaching in Bogota, so I´m still learning quite a bit about my students` attitudes towards learning English. Overall, the government has been making great efforts to promote language eduaction. They have an initiative called Colombia Bilingue where they are trying to achieve a bilingual population (but the date for “achieving” this is constantly pushed back). The students, on the other hand, are often very unmotivated about learning. The students at my school take English as a requirement, so there is little to no interest in actually learning the language except for in the case of a few, very motivated students. As for teaching English, I went to school and studied to be a Spanish teacher, so I came prepared with teaching strategies and just had to brush up on my knowledge of English grammar! It seems odd for an area that rents rooms out to students and people doing internships needs a co-singer that owns land in Colombia. It also seems kind of scary to be thrown out right after orientation to find an apartment, but at least you have two other people to help you. Was the dialect any different from the Spanish you studied in college? I think that it is awesome that you are teaching English in a foreign country, and i envy you when it comes to not having to worry about bugs! Overall great article! The dialect is a bit different than what I learned in school. I had to learn slang and other phrases when I got here. However, Bogota is often considered to have the most “neutral” dialect of Spanish in Latin America (similar to how some people say people from the MidWest are easier to understand than other areas of the United States). There were definite differences, but I think the “neutral” dialect has made the Spanish a bit eaisier to recognize. Wow, this sounds like a really cool experience! I couldn’t imagine going from an environment like Minnesota to Columbia. That is so cool that you are taking a year off and working as a teacher in Columbia too. I do think one of the craziest parts of the story is the lack of mosquitoes! Must have been life changing! Would you ever consider staying there long term if you loved it? Interesting thought. I´m glad you think the experience is cool! Colombia is definitely a very awesome place to live, and I´m coming to terms with the fact that I won`t be able to see the whole country during my 10 months here, but I don`t plan on staying after my 10 month grant. After graduating I was so excited to become an elementary classroom teacher and I`ve put my career plans on hold to come to Colombia. When I`m done I plan on coming back to the United States and finding an elementary school to teach in. I am considering what I want to do directly out of college. I am majoring in social studies education and am contemplating either Fulbright or another teaching abroad experience. I think my standards for a living quarter are relatively low compared to most people as I have lived comfortably in both very small houses with my family of 5 (an example being a 750 sq ft home) and very old and run down houses. I really appreciate you sharing your experiences. I can’t wait to read more from you! If you´re interested in Fulbright you should definitely follow through with applying! Being adaptable to different living situations is definitely a must, but being adaptable to working environment is a must as well. At least in Colombia, the teaching environment, communication, and job expectations, hours, and resources are completely different. It can be very frustrating at times, but very rewarding as well. Those that join the program expecting a schedule like in the United States often end up leaving early because it isn`t what they wanted. The jump from full time living in the upper midwest to Columbia must’ve been very difficult at first, especially not having great living amenities when you moved to the city of you university. I am still somewhat shocked that the bug count is so low even despite the low elevation and cooler weather. That breaks down somewhat of a stereotype for me based on the outlook of someone in North America assuming there would be a warmer climate and more bugs in South American countries. I hope all is well for you and you’re enjoying life in Columbia and look forward to reading more about your experience. One further question, you’ve spent time in class rooms teaching in both continents now, what are some of the biggest differences in the children that you’re molding the young minds of? Sounds like an incredible adventure. I admire your bravery going into a new country without someone to hold your hand or ensure you have a place to live. I also hope to live abroad after graduation so I’m grateful of you sharing your story and your struggles. I hope to hear more in the future! Sounds like quite the experience! That part about having a land-owning cosigner was interesting to me. Maybe I’m reading far into it, but I wonder what the origin or purpose of that law is. In some cases, I would imagine it would be seen as discriminatory. It seems like you’re having a great experience so far! It’s interesting how things in different cultures are so different, like having so many different things included with your rent. I was surprised, too, that $250 per month for rent is considered high – that’s definitely unheard of for even a place that is unsafe in Duluth. I’m thinking a little of going abroad for at least awhile after I graduate, and although it would be to an English-speaking country, reading your experiences is definitely helpful! Your thoughts/worries about bugs and mosquitoes made me laugh, mainly because I would have done the same! It sound like quite the experience. I feel that house hunting might be a bit more difficult in another language, even if one speaks it fluently. A good challenge though. The idea that while renting a room, you aren’t allowed to use the kitchen is very interesting to me! Would the rent be cheaper because you had to constantly be paying for meals? How do you think your American culture shaped your views when searching for an apartment? Had you been with a local do you think their ideas of the rooms would have been much different than yours? I can only imagine how flexible you must be to try and find housing in a different country. Was there ever a time when you felt your search was fruitless, or that you would be unable to find a place? Searching for a place to live is an exhausting search, especially if there are laws and regulations like the ones you mentioned. Thank you very much for sharing your experience! I am glad you took a year to work abroad before starting to work here, sometimes we need to step away and experience something new. I bet your experience will teach you a lot and give a better perspective. I had friend from Colombia that shared much the same stories about Bogota, It seems like a wonderful place! I do find the bit about having a land-owning cosigner to rent interesting and something to look into. I also noticed in your replies the differences between the universities in the US and there; we have the same differences in Ethiopia. Your choice in what to study is quite limited and usually not even up to you.